If you like curry and craft beer then Himalaya Table needs to be on your to-go-list of places. It has a great atmosphere, delicious food, reasonable prices, and friendly staff. The main problem with Himalaya Table is that it just doesn’t feel like somewhere you can sit and drink unless you are at the counter – I felt like I had to order some food to go with the beers, else I may have been shunned. The bar is fully non-smoking and there isn’t a table charge either. So what are you waiting for? Himalaya Table, at the time of writing, just recently celebrated their fourth anniversary (2017) and it was just the right timing – we popped over to join in, only to find out that the bar was fully booked and there was no standing space. A couple of weeks later, we made a trek over and found Himalaya Table to be half full with space at the counter with some friends. Himalaya Table is located about five minutes from the west exit of Kanda Station, though you do have to meander through some back alleys and streets. Moreover, don’t forget to look up, else you might miss it as it is located on the second floor. There is space for 6 people at the counter with about 20 seats dotted around tables in the building. The whole place is non-smoking and there is also no table charge as well. There was also some English spoken and on the menu though it would help to know some Japanese. Not a bad beer list by any means. There are ten taps of craft beer on tap Himalaya Table, with there being a heavy leaning towards Japanese breweries. Beers come in two sizes: half pint (270ml) at ¥700 and then pints (470ml) at ¥1000. Those prices also include tax as well, putting Himalaya Table towards the mid-range price of bars in Tokyo. There wasn’t any sign of a happy hour, nor of a beer flight. The beers were well served and also the bar staff knew a lot about the beers, eerily so as they asked what kind of beer I wanted and how I was feeling. I usually pay a therapist for this kind of breakdown but heck, if it’s free, then I’ll take it. 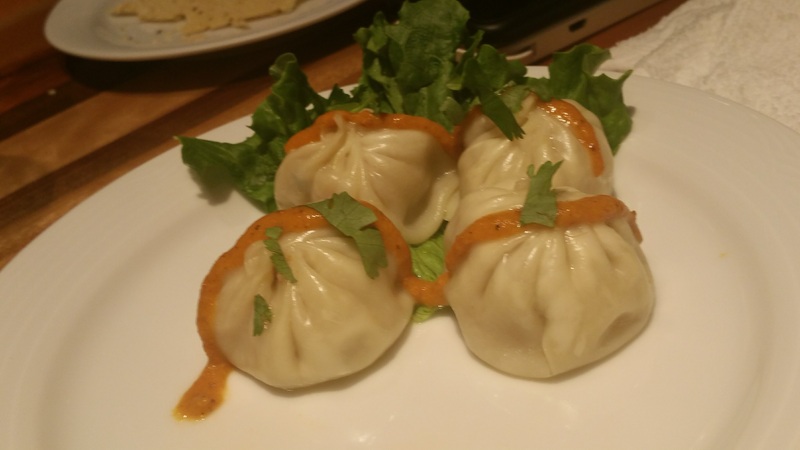 Lamb gyoza – the smell… incredible. The taste? Even better. The food at Himalaya Table is cracking. Due to being stuffed up at Tap x Tap, I wasn’t that hungry but smelling curry and lamb gyoza and chappatis made my mouth water. And the gyoza – wow – amazing. Who cares if they don’t have chips on the menu (psst I don’t know if they do or not but when you come here, the curry is all you need to go for). I’m sure that the curries at Himalaya Table taste as they good as they smelt and looked. Next time I go, I’ll order one and post a pic here. The closest station to Himalaya Table is Kanda on the JR East Keihin-Tōhoku Line, Yamanote Line, and Chūō Line Tokyo as well as the Metro Tokyo Metro Ginza Line. The bar is a mere couple of minutes walk away from the east exit.